There has been a battle brewing the last few weeks on whether the local metro counties would approve an increase in the state sales tax by 25 cents. The additional funds would go to development of new rail lines and bus transitways. There is no guarantee that the money collected will go to the projects it was voted for. Sure, the politicians tell us not to worry, and that the money will be allocated correctly, but let’s get real. This new tax is estimated to bring in 100 Million dollars for 2009. That’s alot of money for politicians to dip their hands into for other projects, and quite frankly, I just don’t trust the Dems in power right now to keep their hands out of the cookie jar. Hennepin County, as part of their vote, thankfully added the provision that is the funds are used for anything else, then they will withdraw from the sales tax increase. Many voters objected to the tax increase. Case in point, in Washington County, a large amount of the public that attended the county meeting in Stillwater opposed the increase and voiced their objections; however, that did not stop the county from approving the tax increase. So it looks like the will of the people is being ignored, once again, in the state of Minnesota. Of course, it doesn’t help that other county boards that had previously approved the measure were threatening the remaining counties with lawsuits if they did not agree to the sales tax increase. Wow, that a great way to get approval. 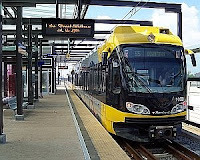 According to the Star Tribune, “Supporters said the agreement will make the Twin Cities more competitive with Denver, Portland and other areas with similar taxes, which gives them a source of funds to match federal transportation dollars that in some cases could pay for half the project cost.” Umm…keeping up with the Joneses, last time I checked, was not a valid reason for increasing taxes. Our sales tax in NYC is 8.25%. There is no tax on food though. I can believe you have a high tax. Here in MN, clothes are not taxed in addition to the no tax on food.